Halloween Day is a big event in the USA an Britain. Who celebrates Halloween in the United States? Almost everyone! Children, teenagers and many adults dress up in costumes with masks. Some costumes are scary, and others aren´t. Let´s see what happens! Halloween at school is an exciting day. Schools are decorated with ghosts, whitches, bats, spiders and pumpkins. On Halloween morning, smaller children go to school dressed in their costumes. Older children bring their costumes to school. They also bring sweets and other party food After lunch, they put on their costumes. Some teachers put on a costume too. There is a Halloween party in the afternoon. 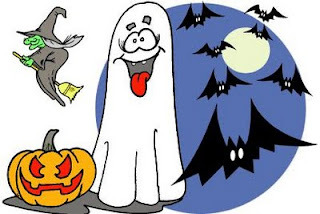 Typical Halloween food is nuts, popcorn, pumpkin pie, liquorice, sweets and candied apples. The Halloween drink is apple cider. There are many Halloween games. An exciting game is called "bobbing for apples" (Remember that the ancient Druids considered the apple sacred and lucky!) There are many apples in a big basin. The big basin is full of water. Children try to catch an apple with their mouth and teeth. They cannot use their hands! After teh school party, everyone helps to clears up. Teenagers in middle school and high school have a Halloween party and dance. The party is in the evening in the school gymnasium. Everyone goes to the party with a costume and mask. There is a prize for the best costume!